Twitchers following rare bird alerts to look for new birds to add to their lifelists. Twitching is special & twitchers improve their odds w/ practice. 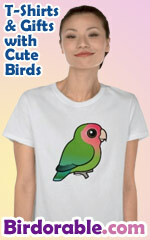 Here's a fun design for rare bird twitchers!